The Pew Global Attitudes Project finds that most key democratic values are broadly supported throughout the 35 developing nations surveyed. In nearly all of these countries, majorities say it is important to live in a country where the six democratic principles included on the survey are respected. 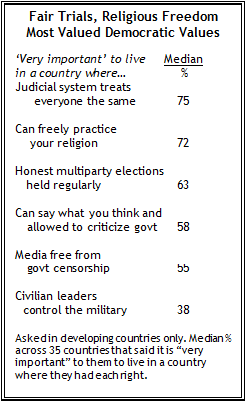 And in most countries majorities say these features of democracy are very important. An impartial judiciary and religious freedom are generally more highly valued than are free elections, free speech and a free press, but majorities in most developing countries surveyed say it is very important for them to live in a country where these principles apply. At the same time, majorities in just six countries believe it is very important that the military be under the control of civilian leaders. Civilian control of the military is the only democratic value, of six mentioned, that is not strongly endorsed by publics in a majority of the countries surveyed. While most people throughout the developing world say it is very important to live in a country that nurtures and protects basic democratic values, relatively few say they live in a country where the judicial system is fair, elections are honest, free speech is protected, and the media is free from government censorship. Across all regions, the surveyed publics place great value on a fair judicial system. Strong support for an impartial judiciary is nearly unanimous in Ethiopia (91% very important), and at least eight-in-ten in 10 other countries, including Egypt (88%), Tanzania (87%) and Lebanon (86%), share this view. Only in Bolivia do fewer than half (48%) say it is very important to live in a country where the judicial system treats everyone the same. Freedom of religion also is highly valued in most countries where the question was asked. This freedom is seen as particularly important in Africa and throughout the Muslim world, while publics in Eastern Europe are significantly less likely to say it is very important for them to live in a country where they can practice their religion freely. For example, nine-in-ten or more in Senegal (95%), Ethiopia (92%), Tanzania (92%), Egypt (90%) and Kuwait (90%) say freedom of religion is very important, but fewer than half in Bulgaria (49%), the Czech Republic (48%) and Russia (45%) share this opinion. In general, the publics of the 35 developing countries surveyed place less importance on other democratic rights, though majorities in every country rate each of these freedoms – with the notable exception of civilian control of the military – as at least somewhat important. Honest elections featuring at least two parties are valued particularly highly in Lebanon, where 81% rate this as very important. In addition, majorities in every African country surveyed say it is very important to live in a country where honest competitive elections are held regularly. By contrast, only about four-in-ten people in Indonesia (39%), Russia (41%) and Bolivia (41%) view honest elections as very important. 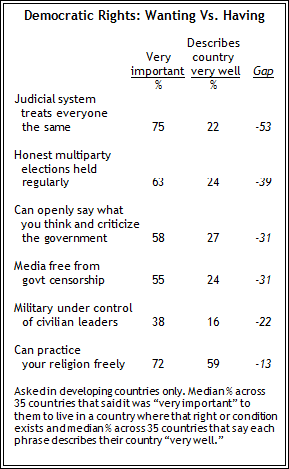 There are also substantial differences in attitudes about the importance of freedom of speech. Again, overwhelming majorities in Lebanon (86%) and Egypt (80%) say it is very important to live in a country where people can openly say what they think and are free to criticize the government. On the other hand, only about a third in Malaysia (33%) and Russia (34%) say this is very important. Notably, fewer than half in each of the six Eastern European countries surveyed – including Russia – regard the freedom to criticize the government as very important. Majorities in most of the developing countries surveyed say it is very important for them to live in a country where the media is free to report the news without government censorship. A free press is viewed particularly important in Latin America, where majorities in six of the seven countries surveyed endorse this core value. In contrast, freedom of the press is a lower priority in Asia: only about half say this is very important in India (51%) and Pakistan (50%), and the importance of a free press is even lower in Indonesia (33%) and Malaysia (32%). Civilian control of the military is generally viewed as less important than other democratic principles. Fewer than half in 28 of the 35 developing countries say civilian control is very important. Opinions on this issue vary widely – the share of the public saying this is very important ranges from just 3% in Jordan to 65% in Senegal. Views about the importance of democratic values vary considerably among different regions of the world. In general, the emerging democracies of Africa and the Middle East offer the strongest support for the six principles tested while Eastern Europeans and Asians express the least. In Russia, for example, when the median across all six values is taken, fewer than half (41%) say these democratic principles are very important to them. There also are substantial differences in these opinions within regions. In Latin America, Chileans generally view all six democratic rights as very important; the median rating is 71%. By contrast, the median number in Bolivia viewing these rights as very important is just 44%. Median support for democratic principles surpasses 60% in eight of 10 African countries surveyed. In South Africa, however, the median number rating democratic principles as very important is just 50%. Moreover, just 22% of South Africans view civilian control of the military as very important, by far the lowest percentage among African countries surveyed. There also are sharp differences in opinions about the importance of democratic rights among publics in the Middle East. In Lebanon, a country rocked by political instability since the assassination of Prime Minister Rafik Hariri in 2005, the median number rating democratic principles as very important is 83%. That is the highest median among 35 countries surveyed, and fully 32 percentage points higher than the median number viewing democratic values as very important in Kuwait (51%). While publics throughout the developing world view most democratic rights as very important, they generally believe their countries are not doing very well in providing these basic rights. The only area where people highly rate the efforts of their countries is in ensuring freedom of religion. Majorities in 26 of the 35 developing countries surveyed say the phrase “you can practice your religion freely” describes their country very well. By contrast, majorities in only three publics say their countries have done very well in holding honest multiparty elections. Rather, the prevailing view among most surveyed publics is that their countries have done at least somewhat well in this regard. And in several countries, including Nigeria and Uganda, majorities say their countries have done not too well or not at all well. Palestinians are the only public surveyed in which a majority (64%) says the phrase “there is a judicial system that treats everyone in the same way” describes their government very well. 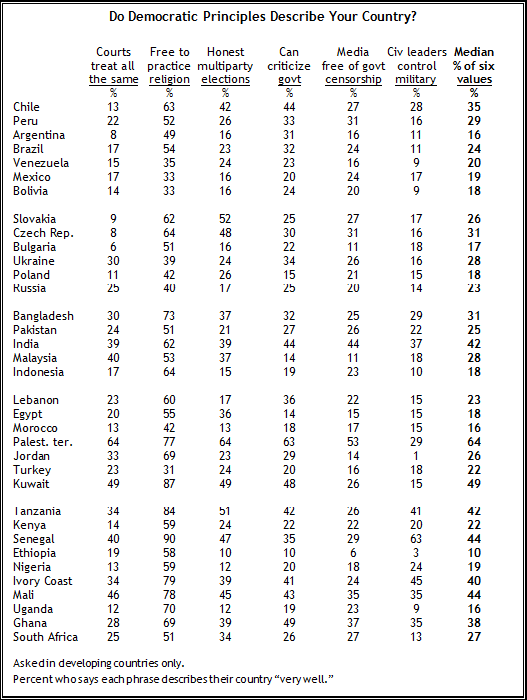 Most publics express negative views of their countries efforts to establish an impartial judiciary. Majorities in five of six Eastern European nations say their countries have done not too well or not at all well in ensuring equal justice for all. The Pew survey finds that the “democracy gap” – the difference between what people find very important and how well it describes conditions in their country – is greatest on the issue of whether a country’s judicial system treats everyone the same. This gap is especially notable in Eastern Europe. In the Czech Republic, for example, 84% say is it very important to live in a country with a fair judicial system, but just 8% say that such a system describes their country very well, a 76-point difference. Publics across the developing world also are considerably more likely to say that honest multiparty elections are very important to them than to say this tenet of democracy describes their country very well. In Lebanon, for example, where 81% strongly endorse the principle of free elections, fewer than one-in-five (17%) say that right is fully afforded to them. This gap is also wide in Latin America, where it ranges from 25 points in Bolivia to 53 points in Argentina. Only in the Palestinian territories and in Kuwait is there no gap between the percent who say honest multiparty elections are very important and the percent who say the phrase “honest elections are held regularly with a choice of at least two political parties” describes their country very well. There also are substantial differences between the broadly shared support for freedom of speech and views of how well countries are doing in providing this right. In the Middle East, 80% of Egyptians strongly value free speech, but just 14% describe their country as one that fully affords this right. Similarly, the rights gap on free speech stands at 50 percentage points in Lebanon (86% strongly want the right, 36% say it describes their country very well) and at 45 points in Morocco (63% vs. 18%). People also are more likely to rate a free media as very important than to say that this feature of democracy describes their country very well. This is especially the case in Latin America, where the democracy gap on this issue is 40 points or more in Argentina, Chile, Venezuela and Peru. The democracy gap is smallest as it relates to the right to practice one’s religion freely. The difference in the percent who say this core democratic value is very important to them and those who say this principle is firmly in place in their country is most apparent in Turkey (39 points), Egypt (35 points) and Ethiopia (34 points). In the Czech Republic, however, more say the phrase “You can practice your religion freely” describes their country very well (64%) than say it is very important for them to live in a country where this is the case (48%). 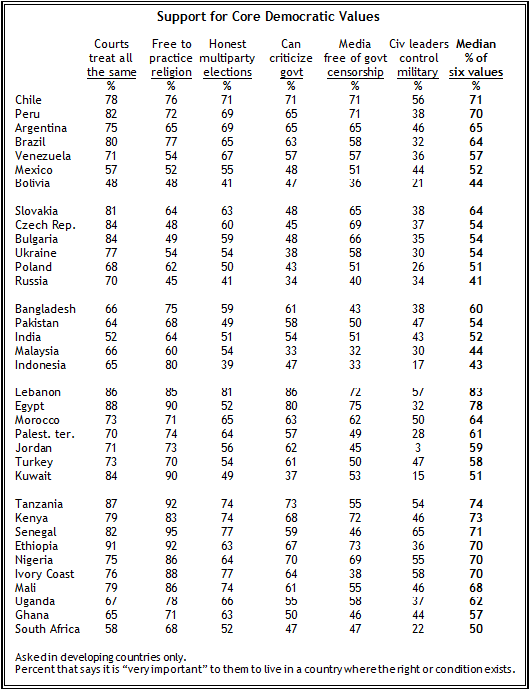 Respondents in all 47 nations surveyed, developing and developed countries alike, were asked to identify which of four alternatives is personally most important to them: being free to say what they want in public; being free to practice their religion; being free from hunger and poverty; or being free from crime and violence. The findings suggest that both in the developed and developing world, basic human needs – the desire to be free from hunger, poverty, crime and violence – tend to be as important as political rights and freedoms, and often are more important. Other patterns emerge from these data. Basic human needs trump democratic principles in Africa, where hunger and crime remain chronic problems. In seven of the 10 African countries surveyed, majorities or pluralities choose freedom from hunger as most important, including 55% in Kenya, 54% in Ghana, and 53% in Ethiopia. In South Africa, where violent crime remains a serious problem, freedom from crime and violence narrowly tops freedom from hunger and poverty (32% vs. 29%) as most important. Among Eastern Europeans, freedom from hunger leads the list in five of six countries; in the Czech Republic, comparable numbers rate freedom from hunger and freedom from crime as most important (38%, 40%, respectively). But elsewhere no clear regional patterns emerge, with many countries roughly dividing between those who place the greater value on personal security and those who value free speech or religious freedom. In Western Europe, freedom from hunger is the top priority in four of the six countries surveyed, including France where 56% name it as most important. But in Germany and Italy, pluralities prioritize free speech. The advantages of a good democracy and the benefits that flow from a good economy pull the publics in the developing world in very different directions. Majorities in fewer than half the developing countries surveyed (15 of 35) say a good democracy is more important to them than a strong economy, including more than eight-in-ten in Bangladesh (82%) and Venezuela (81%). But majorities in 14 countries put greater value on a strong economy, a view that is especially common in Eastern Europe, where majorities in four of six countries prefer a strong economy. Among the 47 publics surveyed, Indonesians are the most likely to choose prosperity – 77% prefer a strong economy, while only 21% say a good democracy. Five years ago, the developing world also was divided on this question: majorities in 11 countries of the 26 countries where the question was asked preferred a good democracy while 10 favored a strong economy. As with the overall results, trends in preferences since 2002 are mixed but modestly favorable to democracy. In 13 of the 26 countries where data is available, the proportion saying that a good democracy is more important than a strong economy has increased in the past five years, including double-digit gains in Venezuela (+13), Uganda (+11), Slovakia (+10) and Bolivia (+10). But in eight others, the proportion that prefers a good democracy has declined, including Indonesia (-9), Turkey (-8) and Jordan (-7). There is no clear correlation between prioritizing “being free from hunger and poverty” and prioritizing a strong economy over a good democracy. Freedom from hunger is most valued in 19 of the developing countries where the two questions were asked. Of these, majorities or pluralities in nine countries prefer a strong economy over a good democracy. But in seven other countries, most favor a good democracy. When the analysis is expanded to include countries where freedom from hunger is not the most-valued principle, a general pattern emerges: as concern over hunger and poverty increases, the preference for a strong economy rises modestly and the proportion preferring a good democracy declines. In nearly every developing country surveyed, there is a “prosperity gap” – the difference, often substantial, in the proportion of people who say it is very important to live in a country with a prosperous economy and the proportion describing their country’s economy as very prosperous. The gap exists in virtually every country surveyed, but is particularly striking in Egypt, Bulgaria and Lebanon. More than nine-in-ten Egyptians (92%) rate economic prosperity as very important, but just 7% say the phrase “there is economic prosperity” describes their country very well. The prosperity gap is nearly as large in Bulgaria (84 points) and Lebanon (80 points). Publics in eight of the 10 countries with the largest prosperity gaps name freedom from hunger and poverty as more important to them than religious freedom, free speech or freedom from crime and violence. In Bulgaria, where there is a huge prosperity gap, 59% most value freedom from poverty and hunger, the largest proportion in any country in the survey to say this is more important than freedom of religion, free speech, or freedom from crime and violence. A plurality of Egyptians also chooses freedom from hunger over other freedoms. Most of the publics in developing countries believe that a democratic form of government, rather than a “leader with a strong hand,” is the best approach for solving their countries’ problems. But there are a number of notable exceptions, including Russia, where public preference for a strong leader is most extensive among the 35 countries where the question was asked. More than twice as many Russians believe that a strong leader, rather than democracy, can solve the nation’s problems (63% vs. 27%). The belief that democracy is better for solving national problems is most prevalent in Slovakia (88%), the Czech Republic (85%), Ivory Coast (85%) and Venezuela (84%). Venezuelans prefer democracy over a strong leader by greater than five-to-one, by far the largest margin of Latin American countries surveyed. Majorities in nine of 10 African countries say they prefer a democratic form of government over a strong leader. But South Africans are evenly divided, with roughly half saying the country should rely on democracy to solve problems and about the same number saying strong leader (49% vs. 48%). Among predominantly Muslim publics of the Middle East, democracy also is generally favored. However, the Palestinians favor a strong leader to solve problems, rather than democracy (by 52% to 36%). In some countries, there have been striking changes in opinions on this measure since 2002. Five years ago, Poles were divided over whether democracy (41%) or a strong leader (44%) was the better approach to the nation’s problems. In the current survey, however, a solid majority in Poland (57%) prefers democracy. Support for democracy over a strong leader also has increased in Nigeria (by 13 percentage points) and Uganda (13 points). In Kenya, by contrast, significantly fewer people favor democracy to solve the nation’s problems than did so in 2002 (77% then, 59% today). People in predominantly Muslim countries in Asia and the Middle East continue to express strong belief that democracy is not just a Western way of doing things and that it can work in their countries. Solid majorities in Kuwait (81%), Lebanon (79%), Jordan (70%), Malaysia (69%), Bangladesh (67%), the Palestinian territories (60%), Egypt (59%), Indonesia (58%), and Morocco (57%), and nearly half (48%) in Pakistan, say democracy is not just for the West. Still, considerable minorities in several countries, and fully half in Turkey, express skepticism that democracy can take root in their countries. More than one-in-five in Indonesia (24%), the Palestinian territories (25%), Jordan (27%), Egypt (35%), and Turkey (50%) say democracy is a Western way of doing things. Views about democracy have changed dramatically in Turkey since the question was last asked one year ago. In 2006, Turks were nearly divided – 38% said democracy was just for the West and 44% said it could work in their country. Today, however, just 31% of Turks believe democracy can work in Turkey, while half say it is a Western way of doing things. Publics in Egypt, Jordan, Lebanon, and Indonesia are also significantly less likely to say that democracy can take root in their country than in recent Pew Global Attitudes surveys. In contrast, higher proportions of Palestinians and Bangladeshis say that democracy can work in their countries than in previous surveys.